At the end of the meeting, planning board member and City of Kingston staff Mary Jo Wiltshire expressed concern that the public wasn’t clear on the public speaking policy for the planning board (and she’s right). She asked what the planning board could do to help the public, with a surprising amount of pushback from her colleagues (review video below). There is a 15 minute public comment period is at the top of every meeting (I would expect if there were a large turnout and interest, the time could be extended by making that request to the planning board chair). The public can speak on any item on or off the agenda at this time though comments during the general public comment period will not go on record. The public is asked to hold their comments on an item when a scheduled public hearing appears later on the agenda. Only comments made during public hearings go on record. For example, last evening, if you attended the planning board to speak on the “super garage” project, you could have only done so at the top of the meeting (as there was not a scheduled public hearing given the project was being newly introduced). There will be many times to do so in the future. If you were in attendance to speak on the proposed communications tower where a public hearing was scheduled, you would be expected to wait until the public hearing so that your comments would go on record. Please come prepared with a statement 2 minutes or less in length to address the planning board. The planning board does not respond to public comment. PUBLIC COMMENT PERIOD – On items on agenda not open for public comment. Clarity on public hearing items. Item #3: #17-19 Abeel Street SPECIAL PERMIT RENEWAL to establish 4 residential units in an exis ng building. SBL 56.43-3-21. SEQR Determination. Zone RT. Ward 8, HAC. Paul Jankovitz/ applicant; HVK Consulting/Corryn Carey/owner. Backyard abuts the rooftop structure. Reconsider rooftop before giving a permit. Item #4: #205 Clinton Avenue (209 Clinton Avenue) – SPECIAL PERMIT Renewal to operate a daycare center. SBL 56.91-3-32. SEQR Determination. Zone O-2. Ward 2. YWCA of Ulster County; applicant/owner. OUTCOME: The Planning Board extends the SEQR Type II project for five years. Item #5: #134 Hunter Street SPECIAL PERMIT Renewal for 8 residential units in the RT Zone. SBL 56.50-5-1. SEQR Determina on. Zone RT Ward 8. RUPCO; applicant/owner. Planning board points out a number of police calls to property. The property manager explains that one of the residents living there have foster children and the calls might have been made because there were visitors who were not supposed to be there. The incidents are not from the residents themselves, but unwanted visitors. When asked by the public to please speak into the mic, Jacobson says, “I am sorry, but I’m using mic…we can’t pass the mic around.” (referring to one that works, as many of the microphones do not). As a public meeting, the public responds with frustration to his comment. Item #6: #54, 56, 58 Johnston Avenue LOT LINE REVISION of the Lands of Bradley and Todd Jordan. SBL 56.106-3-1, 2 & 26. SEQR Determina on. Zone R-1. Ward 1. Brad & Todd Jordan; applicants/owners. OUTCOME: The Planning Board accepts description. Item #7: #261 Flatbush Avenue SPECIAL PERMIT/SITE PLAN to install a wireless service facility/communica on tower. SBL 48.74-4-31. SEQR Determina on. Zone RR. Ward 7. Cellco Partnership d/b/a Verizon Wireless/applicant; John & Tirzah Sheehy/owner. OUTCOME: The planning board tabled the item. Suggests trying to make the towers fit into the neighborhood. Suzanne Cahill explains that the board request a visual test (balloon testing). Weather has made it challenges to accomplish. 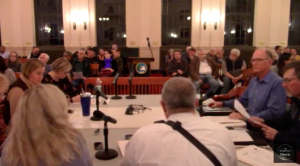 The item was referred to the Ulster County Planning Board, they recommended the same thing. Requests tabling item for the Kingston common council to place a moratorium on communication towers to allow time to analyze the overall planning issue and to decide where and under what conditions tower constructions may proceed. Radiation from communication towers instigate negative health concerns. Concerned with health effects and visual impacts. Cell tower is being proposed near public housing complex, with low income residents who may not be aware of this project. The applicant would be wise to look at the term of the lease (to more short term) with changing technology. Updates the planning board on the balloon tests. The applicant is considering the water tank property in the Town of Ulster. He requests that the planning board table the application while considering the alternate site. The government says (FCC) that local municipalities cannot consider health concerns. As for a moratorium, he stated that the time has come and gone and is only a stall tactic. NOTE: I believe Mr. Olsen is incorrect. The City of Kingston’s Comprehensive Plan and Zoning have been underway, and cell towers need to be incorporated as part of the new vision for Kingston. Model language recommended by the NYS Department of State NYSDOS) is provided above from North Hempstead. There is good information provided in the links above on cell towers written by the NYSDOS lawyers, and provides the rationale for carefully planning for cell towers according to our comprehensive plan and zoning. Item #8: #32 Abeel Street SITE PLAN to construct a 16,213 sf community center. SBL 56.43-5-35.100. SEQR Determina on. Zone RT, Rondout Historic District, HAC. Ward 8. Irish Cultural Center Hudson Valley Inc.; applicant/owner. OUTCOME: The public hearing will remain open until 11/29 and comments can be submitted to the planning department until close of business (4pm). The City Engineer will offer his opinion at the next meeting. In support the ICC Project. Company Hill Path erosion has nothing to do with the project. Heavier rainfall and erosion. One reason the project has been delayed is because its permit expired. Concerned that these projects have may not have money in an account to fix any construction for properties that do not end up being built. The planning department did not release info on what the topic or specifics would be on this item. To not release what will be discussed makes it impossible for the public to participate. Damage to Company Hill Path due to not adhering to OSHA standards. The problem was helped when the city engineer stepped in and forced the applicant to do so. Not sure what this public hearing is about, or to help you to decide. The applicant was told it was lacking updated site plan and other items. NEW BUSINESS – Item 9: #181-207 East Strand SITE PLAN to construct a 12,500sf boat restoration and repair facility. SBL 56.36-1-6. Zones M-2. Ward 8. Paul Jankovitz/applicant; Historic Kingston Waterfront LLC/owner. OUTCOME: The Planning Board tables the item. Paul Jankovitz introduces the project. They are in the first phase, and expect it to take a long time as it’s a complicated project. Robert Iannucci introduces the project as being 16 years in the making. DISCUSSION: – Item #11: #108, 124-134, 136-198, 181-207, 200-206, 208-216, 222, 224-258, 260-270 East Strand and 2, 3, 6 North Street LOT LINE REVISION of the Lands of Historic Kingston Waterfront. SBL 56.43-6-5 & 6, 56.36-1-6, 8, 9, 10, 11, 12, 13, 14, 19, 20. SEQR Determination. Zones RF-R & M-2. Ward 8. Paul Jankovitz/applicant; Historic Kingston Waterfront LLC/owner. OUTCOME: The planning board tables the discussion. An explanation and discussion of the properties. OLD BUSINESS – Item #10: #394-400 Foxhall Avenue SITE PLAN AMENDMENT to approved plan for construction of a 2 1⁄2 story mixed use building. SBL 48.302-4-21.100. SEQR Determination. Zone NB & M-1. Ward 6. Janet and Jim Nelson; applicant/owner. A discussion regarding the proposal. On the Planning Board’s public comment policy.